Coralview Island Resort, Tavewa Island, Fiji Islands. 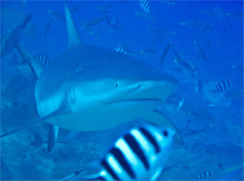 Coralview Island Resort and Dive Yasawa Lagoon have been operating The Shark Dive Experience at Cathedral Reef for five years whilst working in conjunction with the local community in promoting shark awareness and conservation. Coralview Island Resort and Dive Yasawa Lagoon played a key role in protecting the dive area by successfully requesting that the site should become a ‘tabu’ area (tabu meaning a reef declared as a no fishing zone by the high chief of a community). Growing up in the Yasawas, I was taught from a young age to respect and appreciate our marine environment. My love for sharks has developed over the years working as a dive instructor. I believe conserving sharks is of great importance to the marine environment. Sharks are apex predators found at the top of the marine ecosystem food chain and their presence helps to maintain a balance within the environment. 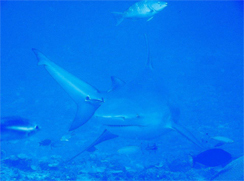 If large, predatory sharks are removed from the food chain; the equilibrium of the ecosystem is disturbed, which can have adverse effects of prey species. This can lead to the degradation of the entire ecosystem. Coralview Island Resort and Dive Yasawa Lagoon have directly benefited the local primary school, Ratu Meli Memorial School by donating $10 per shark diver for the past 4 years and have now increased the donation to $20. This donation is used by the school for educational materials and repairs. 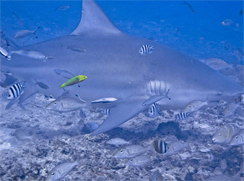 Coralview Island Resort and Dive Yasawa Lagoon will continue to support shark awareness and conservation through tourism and engaging with the local community. - Complete medical form before all dives. - All rates inclusive of all Fiji taxes; are in Fiji Dollars.